This 16 acre site, adjacent to the Conemaugh Dam in southwestern Indiana County, contains significant remnants of transportation history as well as standard park facilities, and access to much more in the adjacent area. Check out our Tunnelview Historic Site Map, as well! A pavilion, restroom, interpretive exhibits and a canoe launch are available at Tunnelview. The Army Corps of Engineers also offers extensive public recreation facilities at the nearby Conemaugh River Lake. Call 724-459-7240 for more information concerning the Corps facilities. 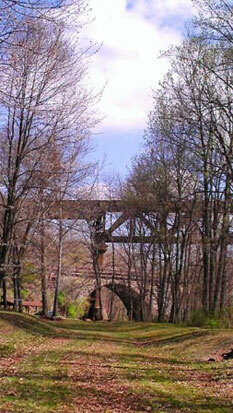 The West Penn Rail Trail runs through Tunnelview Historic Site. This trail runs between Saltsburg and the Newport Road trailhead near Blairsville. The West Penn Trail is operated by the Conemaugh Valley Conservancy.